The ‘410 patent provides a score verification system which verifies that a score of a player in an online game is an unaltered score obtained during the game. The invention features two units: one of them receives the player’s game information as the game advances while the second unit verifies the score to insure no one tampered with the game. High scores are stored on a server where they are analyzed to make sure of their accuracy. A score verification system for verifying that a score of a player having played an online game is a true score of the player. A player terminal receives a game program from an online game server, and the game is played on the player terminal. Plural players execute the same online game, and compete for high score. The score acquired by the player, together with an operation history of the player, is transmitted to the online game server. In the case where the score may be a high score, the same play is reproduced based upon the operation history received by the online game server, and the fairness of the received score is verified based on the score obtained by the reproduction. 1. 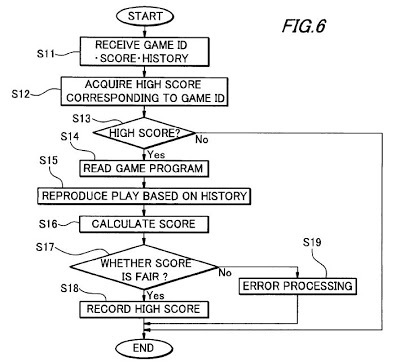 A score verification system for preventing alteration of a score in an online game, comprising: a game program storer that stores a game program of the online game with identification information attached thereto for identifying the game program; a game transmitter that transmits the game program to a player terminal for playing the online game; a game result receiver that receives information relating to a game result from the player terminal, the information including at least the identification information for identifying the game program, a first score calculated based upon an operation of the game program by the player, and an operation history of operation commands of the player; a score calculator that reads the game program corresponding to the identification information from the game program storer and executes the operation commands based on the operation history to reproduce the operation of the game program by the player to calculate a second score; and a score verifier that compares the first score with the second score to verify whether the first score is a true score, wherein the game program records, in the operation history and at a time of receiving each operation command of the player, a frame and a time elapsed from when the frame was displayed by the game program, the frame and the time elapsed being recorded in association with each received operation command of the player, and wherein the score calculator reproduces the operation of the game program by the player based upon the frame and the elapsed time recorded in the operation history.